Offer your customers better, safer soft water. 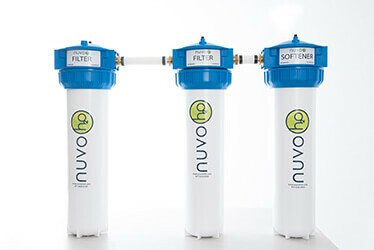 Why sell NuvoH2O as an Authorized Retailer? Since only 25% of homeowners treat their hard water, that means 75% of homeowners who live in hard water areas are doing nothing to treat their hard water issues. You can help them out! 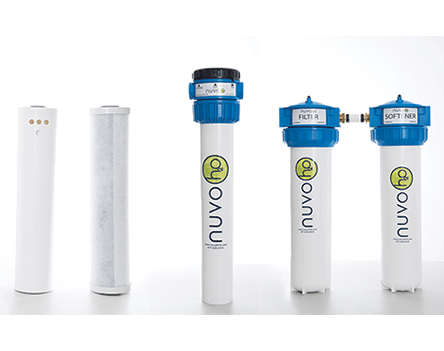 NuvoH2O system binds and isolates the calcium ions, preventing them from precipitating out and forming scale. Once bound to CitraCharge, the NuvoH2O chelant, the mineral cannot form scale. A primary ingredient in CitraCharge is an FDA approved citric acid. Citric acid is a weak organic acid that occurs in fruits and vegetables. It is a natural chelant and preservative, and is used in many foods and soft drinks. CitraCharge naturally decreases the pH of hard water—which is nearly always alkaline—to closer to the neutral range, substantially reducing its potential for scale formation. NuvoH2O offers a wide variety of water softeners to help homeowners pick the right solution for their size of household. What can you offer as a NuvoH2O Authorized Retailer? For homes with 1-3 residents, the smaller cartridges will take care of every basic water-softening need. Home with 4 or more residents will benefit from the larger cartridges to keep up with the higher volume of water usage. For homes with hard and bad tasting water, NuvoH2O has different cartridges that will do both jobs of softening and filtering. Cartridges to soften, improve taste and reduce the amount of iron in a home’s water can be included in this total home solution package. RS&I serves a nationwide program for NuvoH2O Authorized Retailers. No matter where you operate in the United States, we can provide you with sales and installation options in your area. If you’re involved in the installation side of the business, our nine warehouses will bring the proximity you need to save as much as possible on shipping costs. Each of our nine locations also provide a sales team that are ready to provide you with the training and guidance needed to build a lasting and successful business.